Choose Your Year Book and DVD Combo for Years 1930-1981. For a fun gift, get this value-based gift to give for any year anniversary. 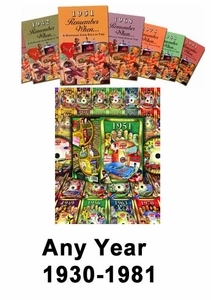 For this combo gift we pair the year 30 minute DVD with the year trivia book. Our 30 minute DVD is narrated and has the top news events from the year, prices are discussed, the major sports events like World Series and Super Bowl, favorite song clips, and film clips. The booklet is in color and has 24 pages of ads, what the cost of a new house is, loaf of bread, events and other fun pictures. We have priced this as a special value price gift!